Характеристики и комплектность могут незначительно отличаться от партии к партии. Circulation liquid of hot, cold or cryogenic can be filled into the jacket of reactor. Substance reacts by stirring under normal or negative pressure in aieproof glass container. Reaction process can be watched clearly through crystal reaction flask. 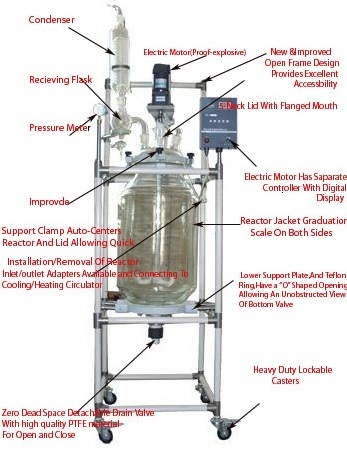 Jacket Glass Reactor is ideal equipment in library experiment or medium-production in moden biology and pharmcy, and is also applied in synthesizing materials in fine chemical industry. 4. 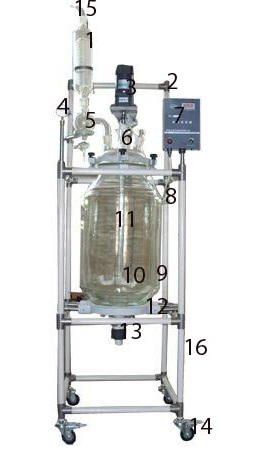 More designs on safe and easy operation are applied on models of 20L and above.